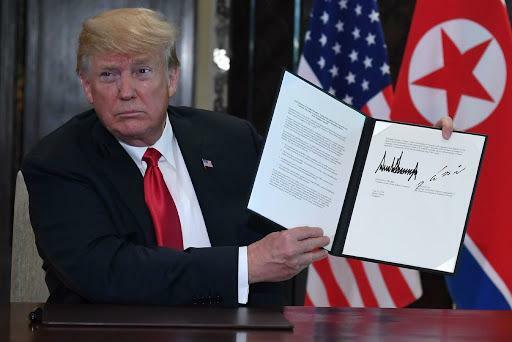 Speaking through an interpreter, Kim said that the two countries “had a historic meeting and decided to leave the past behind and we are about to sign a historic document” adding that "I would like to express gratitude to President Trump for making this meeting happen." 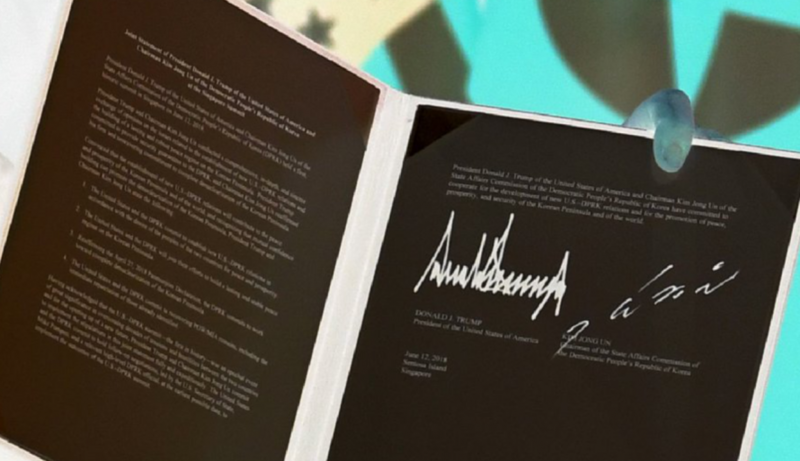 The letter says that the U.S. and North Korea “will join their efforts to build a lasting and stable peace regime on the Korean Peninsula,” and that North Korea "commits to work toward complete denuclearization of the Korean Peninsula." 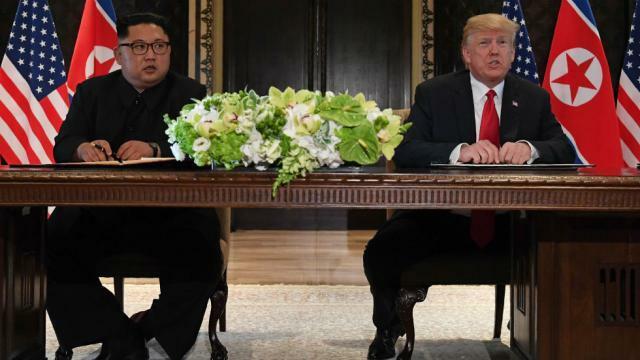 The pair also agree to "establish new U.S.-DPRK relations, and the two leaders "have committed to cooperate for the development of new U.S.-DPRK relations and for the promotion of peace, prosperity and security of the Korean Peninsula and of the world." Kim also thanked Trump for making “this meeting happen." The ceremony concluded a summit meeting that appeared impossible just one year ago, when both men’s threats against each other fueled an growing nuclear crisis. Just last summer, Trump mocked the North Korean leader as "Little Rocket Man" as the two exchanged barbs over their weapons programs. Kim responded by dismissing the president as a "mentally deranged dotard" who would "pay dearly" for his threats against Pyongyang. Trump and Kim, however, appeared to have a friendly rapport during their day together at the Singapore island resort. "The past worked as fetters on our limbs, and the old prejudices and practices worked as obstacles on our way forward. But we overcame all of them, and we are here today," Kim said through a translator as the two met for the first time. “It's going great. We had a really fantastic meeting. A lot of progress. Really, very positive, I think better than anybody could have expected, top of the line, really good,” Trump said as he stood next to Kim after their meetings. Trump did not answer a reporter's question on whether the two spoke bout Otto Warmbier, the American student who died, shortly after his release from North Korean imprisonment in a coma, exactly one year ago. As a reminder, in the lead up to the summit, North Korea released three other Americans who had been held hostage. Pompeo brought them home last month on the second of his two visits with Kim to lay the groundwork for Tuesday. The market reaction to the signing of the "broad" letter has been muted, with the won falling and the USD/KRW climbing 0.2% to 1,077.45 after fluctuating between 1,072.85-1,078.10 as investors no longer expect more to happen for the day after the summit between Trump and Kim ended with the signed document, says Park Ok-hee, an economist at IBK Securities. South Korea’s currency had rallied for five consecutive days to June 7 before slipping on Friday as traders bought the won ahead of the event. The gains were the longest winning streak since early January. Lee Seung-Hoon, head of equities at DB Asset Management in Seoul, said that "the agreement could be vague, as Trump said it is very comprehensive" adding that "there’s consensus in the market that it will be difficult to start a business in North Korea in the near term before the regime really starts shipping out its weapons." The bottom line came from Stephen Innes, head of trading for Asia Pacific at Oanda, who said that "there’s not much of a reaction as traders realize this is little more than the prologue to a long drawn out and lengthy process that could still go sideways. But this is good nonetheless for regional risk".